When you see soldiers running away into the town - what are you to do, other than to just run away as well? "Yesterday at around 05:00 [04:00 GMT] we were woken up by heavy gunshots, and we couldn't identify where the shots were coming from. "They came through the north, the west and from the southern part of the town because the eastern part is only water. So, when we [went] towards the western part, we saw heavily armed Boko Haram men coming towards us. "The soldiers were trying to repel the attack but that wasn't going to happen because a lot of the soldiers were without their guns and some were running into the town. When you see soldiers running away into the town - what are you to do, other than to just run away as well?" In April 2013, at least 37 people were killed and 2,275 homes destroyed in Baga by troops hunting Boko Haram fighters who had attacked a patrol, Human Rights Watch reported. The New York-based organisation accused soldiers of engaging "more in destruction than in protection". Before Saturday's attack on the town, the area was already a stronghold of Boko Haram, which has been waging a bloody insurgency to create an Islamic state since 2009. 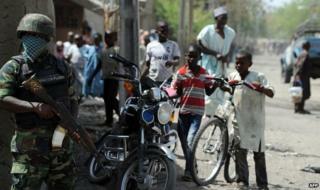 More than 2,000 people were killed in militant violence last year in the north-east. Days before the attack on Baga, suspected Boko Haram militants kidnapped about 40 boys and young men in a raid on the remote Borno village of Malari.